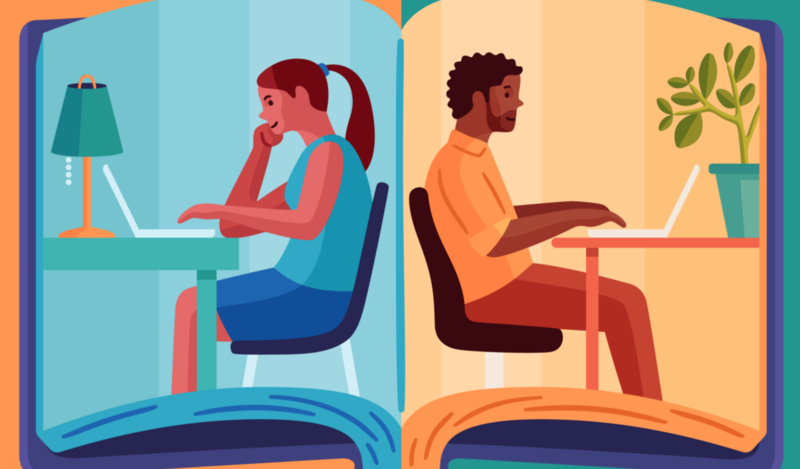 If you haven’t heard, remote work — that is, working outside of or without a physical company office — is on the rise, with 43% of employed Americans working remote at least part-time in 2016. Remote work can provide huge boosts in productivity and decreased overhead costs, but it does come with its own set of management challenges that can be hard to navigate if you’re used to dealing with in-person teams. In this post, we share wisdom gathered from our own experiences and conversations with tech leaders and workers on distributed teams. We hope that the wisdom from those who’ve tackled (and mostly overcome!) the unique challenges of working in geographically-distributed teams will help you figure out how to make it work for your teams! Team communication is important no matter what kind of team you’re running, but with remote teams, it’s doubly so. Aside from the potential pitfalls of text-based communication and discerning tone via text, there’s also balancing immediate communication, like having a conversation via phone/video call or even via DM, and asynchronous communication, where there might be a delay in response anywhere from a few minutes to a few hours or even a day. You want to structure your team communication so that everyone knows what’s going on and can get the answers they need, without being overwhelmed and distracted by a constant flow of messages. For example, Slack is technically asynchronous, but it’s often used with the expectation of an immediate response. The expectations around email can be similar, with some company cultures being okay with a 24–48 hour turnaround time unless there’s an emergency, and other teams expecting replies right away. If one person on one team is interfacing with someone on another team and is expecting immediate replies, but getting slower ones, there’s bound to be friction. When working with a physically-distributed team, you should aim to create clear guidelines in your company about which communication tools are used an in which ways. In addition to creating guidelines on how specific communication tools are used, it’s also good to design clear boundaries that your team can use. In order to be their most productive, many of your team members may need to be able to have uninterrupted “heads down” time, in which they can enter “flow state.” We’ve talked about this before as it relates to software engineers, but it can be equally important for other team members, too. Brett Collinson, SVP of Product at Backpack Health, notes that this has been something his distributed team has had to navigate. Their initial team was all based on the US East Coast, but as they’ve scaled up, more team members have been added from different timezones. Setting up these guidelines lets people have the time they need to focus, without feeling like they’re being rude to their other team members. If your team is part-remote and part in-office, that brings up a few specific communication challenges. When you’re working with a fully remote team, all of your communication and management policies tend to be created specifically with remote work in mind. However, if you’re adding remote workers into an existing in-office team, you may need to review your policies. Even a relatively small upgrade, like purchasing a webcam that lets the people calling in virtually see everyone in the room, can make a big difference. We recently started doing this at Clubhouse and it’s nice for our remote workers to be able to see everyone in the room and/or the white board, instead of seeing just one person and hearing three different off-camera voices. Here’s Meeting OWL, a unique webcam that we’re going to start using to help with calls. Distributed teams should also consider having regular in-person retreats, as seeing everyone in-person makes a huge difference. For example, information company Proquest brings together its remote teams every four months for a three-day summit to review the work completed and plan their next few months of work. Their division manager says this keeps everyone on the same page and saves time. For them, every four months seems to be the perfect interval to provide focus and context to day-to-day tasks, but you can figure out what works best for you and your team. It’s no coincidence that creating a culture of open communication is so important to Megan Berry, VP of Product at Octane AI, who runs a remote team. She checks in with her direct reports once a week in a 1:1 meeting, but also checks in with members from other teams on a regular basis to get feedback about her team and workflow. One way to make sure people from different teams are communicating is to add cross-functional teams into your workflow. Not only are these teams helpful in preventing siloed teams, they also tend to be better for productivity and innovation. Learn more about cross-functional teams and how to implement them here. When there’s not an actual watercooler for people to convene around, you need to create a virtual one (and the conversations to go with it). Having a “water cooler” channel in Slack gives everyone a place to chat about how their weekend went or share that funny article they found. You can also add in weekly “coffee dates” where members from different teams have 15–30 minutes to chat — not necessarily about work, although that might come up. Allowing for common areas and casual conversations creates a stronger bond and makes it easier to communicate when it’s something important, because you know who you’re talking to and already have a rapport. And, of course, Clubhouse for streamlining software development and keeping everyone posted without having to ping them at 2 AM their time!